This ministry provides our church with the ability to gain access to an extensive collection of books, DVDs, videocassettes, compact discs, and audiobooks. The resource center is open before and after Sunday Services and from 7:00 to 8:00 P. M. Wednesday evenings. The automated catalog of over 7000 holdings may be searchedin the library. The online site is updated every week. Click this link to Search for titles online.You may also reserve or renew titles from the search link! Remember to sign your reservation request so the library team will know who you are. SELECTION POLICY: The church approved selection policy is posted in the library. All materials must be accurate in facts, scriptural interpretation and doctrine. GIFT POLICY: The library operates on small church budget allocation so must depend on generous members and friends who dedicate money in memory or in honor of special people in their lives. The honoree or family of the bereaved will promptly receive written notification of any living tribute. Monetary gifts are preferred to avoid duplications and to be certain the items purchased meets the standards of the church approved selection policy. No provisional gift will be accepted. To make a gift to the library contact one of the library team at 972 225-2612 or by email by clicking link at top of this page. New titles are added every month. The aim is to replace videocassettes with DVDs. The 2019 annual emphasis is THE LIBRARY: THE PLACE TO BE. Use the library at least one time every month of the year to receive a small gift in January 2020. 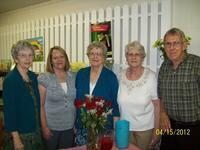 THANKS Library open house is scheduled for April 7 prior to Sunday School. The summer library program "The Place to BE" will invie all ages to visit ten interesting places June 2 to July 24. A Bible Bee will be the highlight of the July 28 library party.